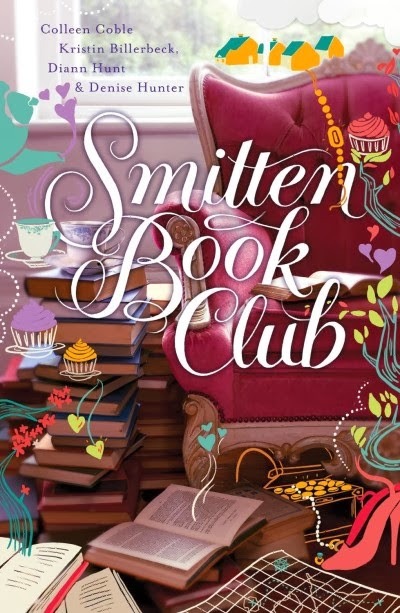 Smitten Book Club is the third book in the Smitten series. Like the previous volumes the book is a collaborative project with authors Colleen Coble, Kristin Billerbeck, Diann Hunt and Denise Hunter. The setting is an idyllic town, Smitten, Vermont. Indeed, Smitten sounds like the number one place on “the best places to live” list. Four women, member of a book club are the protagonists in this novel. Each author has written the story of one of the women, Heather, Abby, Lia and Molly. Together they have many adventures, help each other out and each find the love of their life. If that sounds formulaic, it is. Not only do they find love and happiness, but also each of them has an incident happen where they jumped to conclusions and almost lost the love of their life. I honestly began to give advice as I read, “Just talk to him. Don’t make this huge assumption.” It was painful. The thing is the book is still very enjoyable, in spite of being predictable. I love Smitten, Vermont and it is fun to read about such a perfect small town. Somewhat like Garrison Keillor’s Minnesota community of Lake Woebegone, the people in Smitten are all kind, help each other out, and have wonderful traditions. Unlike Minnesota they live with gorgeous mountain views. The book is relaxing and fun and frankly, realism is highly overrated. So, I do recommend this book. If you like romance it is a shoo-in. It is a fun book and as stated – you will want to move to this town. The book takes place over a year’s time and Smitten is beautiful in each season. Think fall color; perfect Christmas with snow, spring with wild flowers and an idyllic summer.